Sensei Fred Bateman is a very experienced martial artist with over 32 years experience, who has spent time and graded in Okinawa Japan. He still trains in classes in both Karate and Kobudo. He also heads the Matayoshi Kobudo Kodokan International – UK Branch that is associated with his Sensei, Sensei Franco Sanguinetti, 8th Dan (Matayoshi Kobudo Kodokan International www.bushikan.com ). He believes that good instructors need good teachers above them. Some other qualifications he holds are Level III Coaching Qualification in Martial Arts, has First Aid Certification, up to date, as well as keeping his Disclosure and Barring Service (DBS) (previously called CRB) up to date. For more detailed information then click on Sensei Bateman’s History. Chris is currently a 3rd Dan Black Belt in Anshin Ryu Karate-Do. She has also trained and graded in Kobudo. 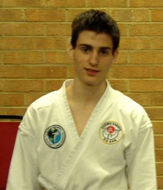 Chris has competed for UKASKO English Kata squad at international level. She has also held the UKASKO Senior Ladies National Kata Title. She is extremely adapt in her Karate instruction and is a stickler for perfection. Sadly Chris takes a minor role at teaching due to her disability as she has arthritis of the lower spine. This prevents her from training but she is a big help as an instructor. Stuart is one of the senior Instructor’s for the Anshin Ryu Karate system, and has been training in martial arts since the age of 7. He is currently a 3rd Dan Black Belt in Anshin Ryu Karate-Do. His other martial background covers Kobudo, Kamishin Ryu and Ninjutsu. Stuart holds the UKASKO national senior Kata title, winning this in two consecutive years. He has also competed for UKASKO English squad at international level. His vast knowledge in Kata that is second to none, and has trained with international karate instructors. His university background provided him with the vital experience for classes in fitness, such as circuit training, which is also taught in the classes. Justin is one of our senior Dan grades which we now value as a Sensei. He takes his martial arts very serious and has studied in other art forms, such as Wing Chung. After a time away from his training ignored to become a PhD in Criminology, Sensei Justin is now back working hard on his training. Sensei Justin has also graded as a Kodokan Martial Arts grading officer for the Anshin Ryu Karate. Furthermore, he has trained and competed for the UKASKO English Kumite Squad. In November 2013 Sempai Michael achieved his Shodan (1st Dan) black belt. He is studying hard to become an Sensei of Anshin Ryu Karate and has the right attitude to make it. He is always seen helping out in class especially in our Saturday classes where he helps our Little Dragons group and takes the junior class. However, at present you will only see him during certain times of the year as he is studying at University. There he has created he own group. Becky has recently graded in 2017 to Shodan and is now training to become a Sensei in Anshin Ryu. She has been training with Kodokan Martial Arts since she was 5 years old as one of our Little Dragons. Since then we have seen her grow in her art and she has become a valuable member. She is also a high Kyu grade in Matayoshi Kobudo school. However, she too has started her University studies in veterinary science so we only see her during holiday season. She has left a legacy though in that her Dad has joined our Kobudo group and has said he hopes to gain on her grade while she is away studying!! Marc Faux is one of our high grade students in the Kobudo school. He achieved is Shodan in 2016 under Sensei Sanguinetti at the 2016 MKKI-UK Gasshuku. You can see Marc San, opposite, getting his Shodan from this event. He takes his duties of Sempai very seriously, and is an asset to the group, and much respected by his fellow students. In fact Marc San wrote an essay as part of his Shodan grading on “The Role of Senpai”. This is an interesting read and would recommend all who study Tradional Martial Arts to read this essay. It can be found on our Student’s Essay Page or on the Blog Pages.